A 2,000-year-old intact and inscribed sundial – one of only a handful known to have survived – has been recovered during the excavation of a roofed theatre in the Roman town of Interamna Lirenas, near Monte Cassino, in Italy. Not only has the sundial survived largely undamaged for more than two millennia, but the presence of two Latin texts means researchers from the University of Cambridge have been able to glean precise information about the man who commissioned it. The sundial was found lying face down by students of the Faculty of Classics as they were excavating the front of one of the theatre’s entrances along a secondary street. It was probably left behind at a time when the theatre and town was being scavenged for building materials during the Medieval to post-Medieval period. In all likelihood it did not belong to the theatre, but was removed from a prominent spot, possibly on top of a pillar in the nearby forum. “Less than a hundred examples of this specific type of sundial have survived and of those, only a handful bear any kind of inscription at all – so this really is a special find,” said Dr Alessandro Launaro, a lecturer at the Faculty of Classics at Cambridge and a Fellow of Gonville & Caius College. The base prominently features the name of M(arcus) NOVIUS M(arci) F(ilius) TUBULA [Marcus Novius Tubula, son of Marcus], whilst the engraving on the curved rim of the dial surface records that he held the office of TR(ibunus) PL(ebis) [Plebeian Tribune] and paid for the sundial D(e) S(ua) PEC(unia) (with his own money). The nomen Novius was quite common in Central Italy. On the other hand, the cognomen Tubula (literally ‘small trumpet’) is only attested at Interamna Lirenas. But even more striking is the specific public office Tubula held in relation to the likely date of the inscription. Various considerations about the name of the individual and the lettering style comfortably place the sundial’s inscription at a time (mid 1st c. BC onwards) by which the inhabitants of Interamna had already been granted full Roman citizenship. Carved out from a limestone block (54 x 35 x 25 cm), the sundial features a concave face, engraved with 11 hour lines (demarcating the twelve horae of daylight) intersecting three day curves (giving an indication of the season with respect to the time of the winter solstice, equinox and summer solstice). Although the iron gnomon (the needle casting the shadow) is essentially lost, part of it is still preserved under the surviving lead fixing. This type of ‘spherical’ sundial was relatively common in the Roman period and was known as hemicyclium. “Even though the recent archaeological fieldwork has profoundly affected our understanding of Interamna Lirenas, dispelling long-held views about its precocious decline and considerable marginality, this was not a town of remarkable prestige or notable influence,” added Launaro. “It remained an average, middle-sized settlement, and this is exactly what makes it a potentially very informative case-study about conditions in the majority of Roman cities in Italy at the time”. 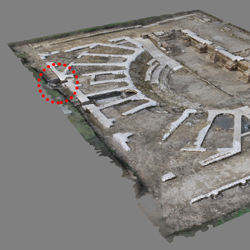 The ongoing archaeological project at Interamna Lirenas continues to add new evidence about important aspects of the Roman civilization, stressing the high levels of connectivity and integration (political, social, economic and cultural) which it featured. The 2017 excavation, directed by Dr Launaro (Gonville & Caius College) and Professor Martin Millett (Fitzwilliam College), both from the Faculty of Classics, in partnership with Dr Giovanna Rita Bellini of the Italian Soprintendenza Archeologia, Belle Arti e Paesaggio per le Province di Frosinone, Latina e Rieti, is part of a long-standing collaboration with the British School at Rome and the Comune of Pignataro Interamna and has benefitted from the generous support of the Isaac Newton Trust and Mr Antonio Silvestro Evangelista. This entry was posted in Archaeology, History, Rome. Bookmark the permalink.